Spray a large pan with cooking oil. Place one tortilla in the pan. Top with half of the cheese, followed by the black beans, peppers and avocados. Top with the other half of the cheese. Cover with the second tortilla. Spray lightly with additional cooking oil spray. Cook, flipping once, until the cheese is melted. But be patient. 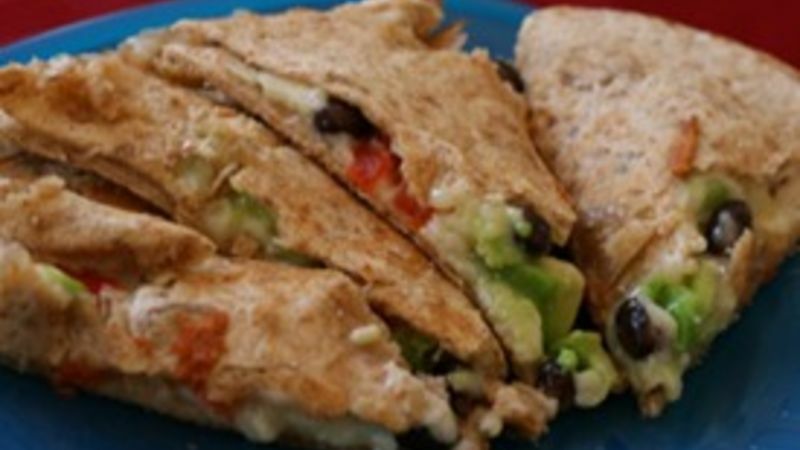 The quesadilla should remain on the first side long enough for the cheese to melt so that you avoid spillage when flipping. Alternatively, divide the ingredients between two tortillas, flipping over to form a pocket while cooking. Use a pizza cutter to cut into wedges. Serve with salsa, if desired.